It started when I read this post from Jann at Have A Daily Cup Of Mrs. Olsen. I was filled with seed box envy. I needed one of these in my life. 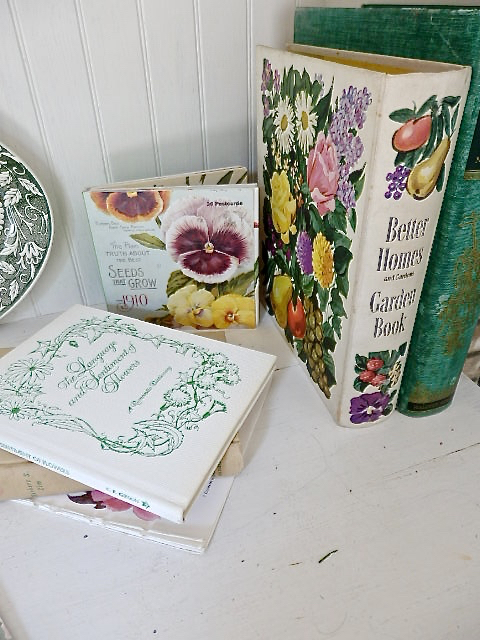 Finding an antique seed box seemed out of the question. We already had the perfect box but I couldn't find it anywhere. It must have been given to the thrift store at some point. No problem. A trip to the thrift store yielded a cigar box. It was a 50% off sale day so the box was only 50 cents. My Martha Stewart Chalk Paint was used to coat it. 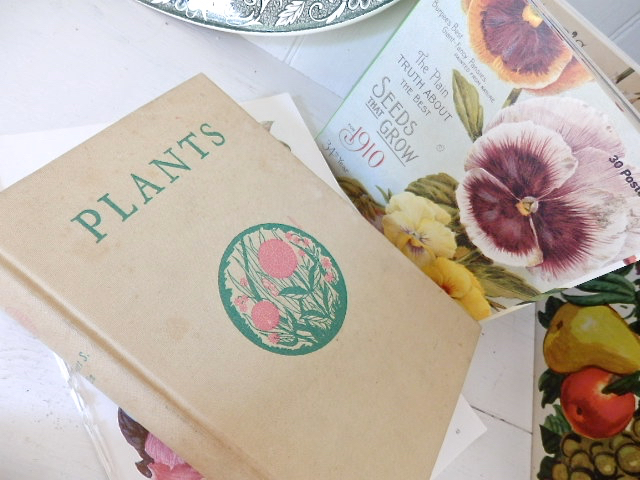 Once it was dry, vintage seed packet images were printed and Mod Podged them to the top of the inside. 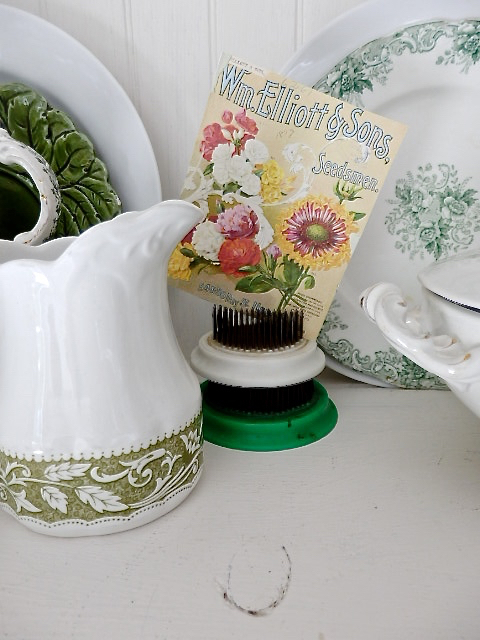 I loved the Sweet William graphic for my Sweet William. 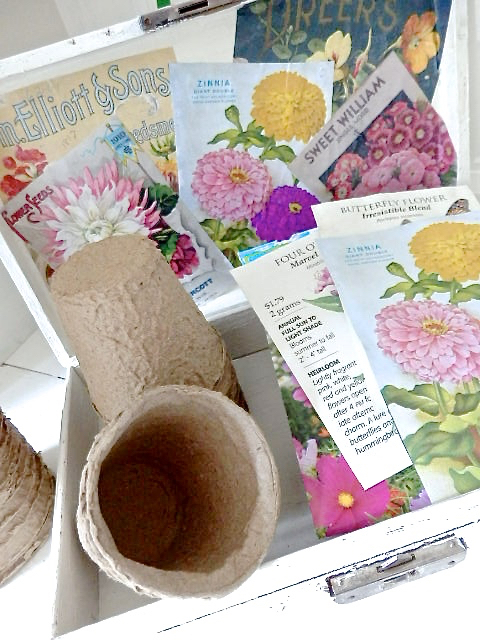 I styled it with seed packets that I've used and some peat pots. The peat pots were ordered off of eBay. 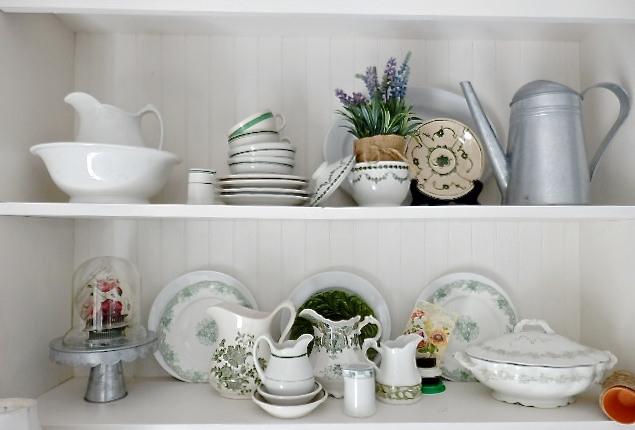 I rounded up some additional gardening accoutrements and styled the dish dresser in the garden room. 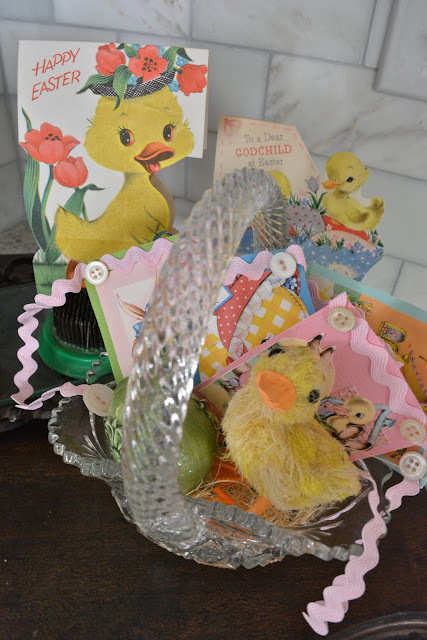 More vintage images were stuck in vintage flower frogs. 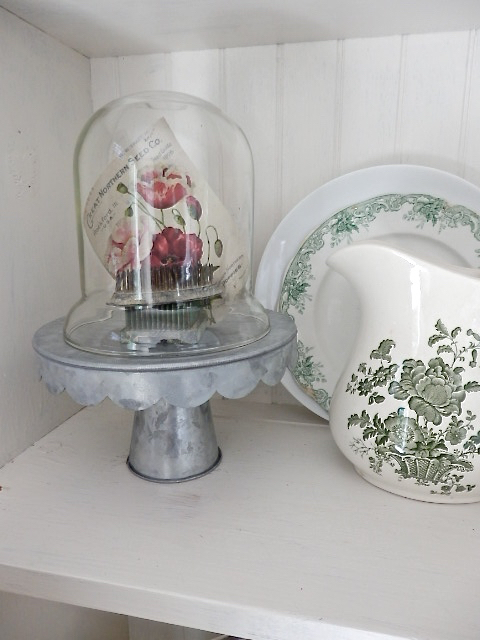 What could be better than a vintage image under a cloche? 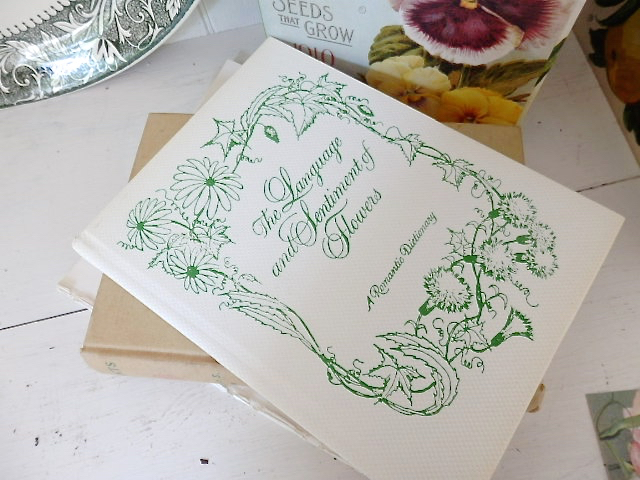 Our gardening books were corralled in the opposite corner. The SOCKER Watering can from IKEA was only $5.99. 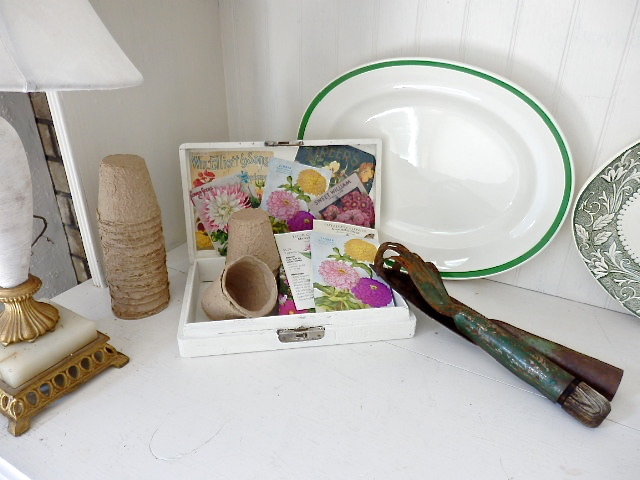 Vintage green flower pots, bird books and a bird house adorn the top of the dresser. 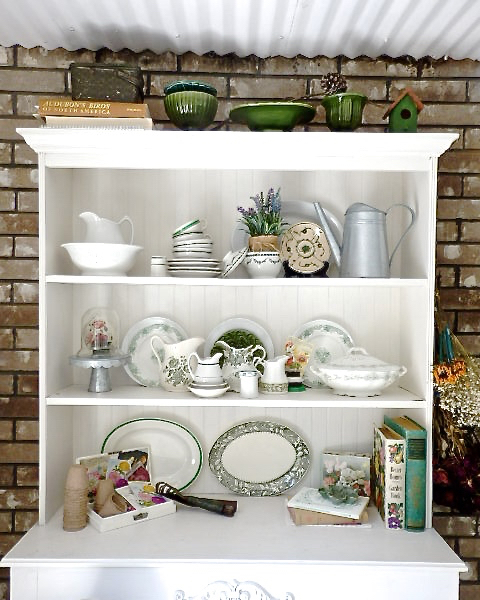 The green transferware creates a color coordinated backdrop. Mod Podge has such a unique smell. I kept smelling something in my craft closet around Christmas time but I couldn't figure out what it was. I thought an animal had died on the other side of the wall. Could it be the old computer cords? Maybe the photos in our photo albums were breaking down and causing the odor. Eventually, it went away and I forgot about it. The other day I was organizing the craft closet. A bizarre formation was on the floor when I rolled out my craft cart. A jar of Mod Podge on the bottom of the craft cart had tipped over. 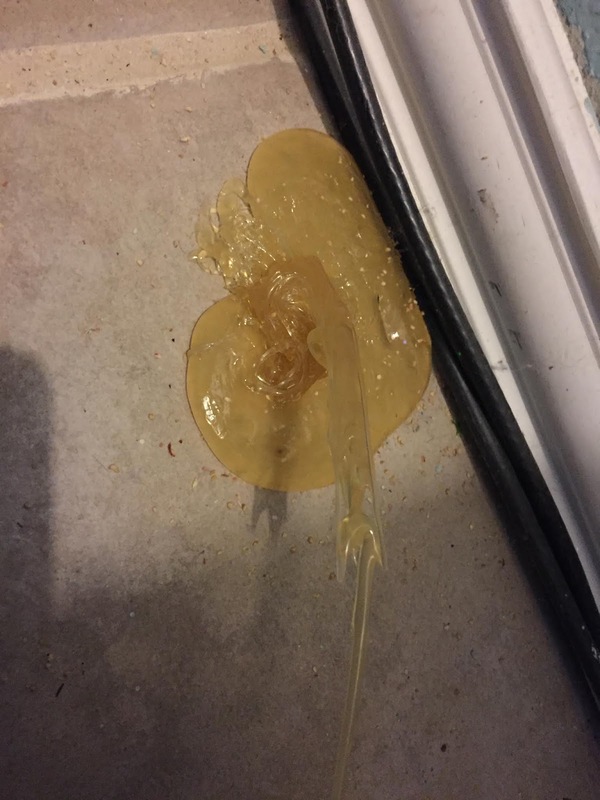 It caused the smell as it oozed out of the jar. Eventually it stopped oozing and the Mod Podge dried. When it did the smell stopped. It peeled off after hitting it with Bill's heat gun. Is it just me or did it used to be called Modge Podge? Anyway, it helped create a darling box. 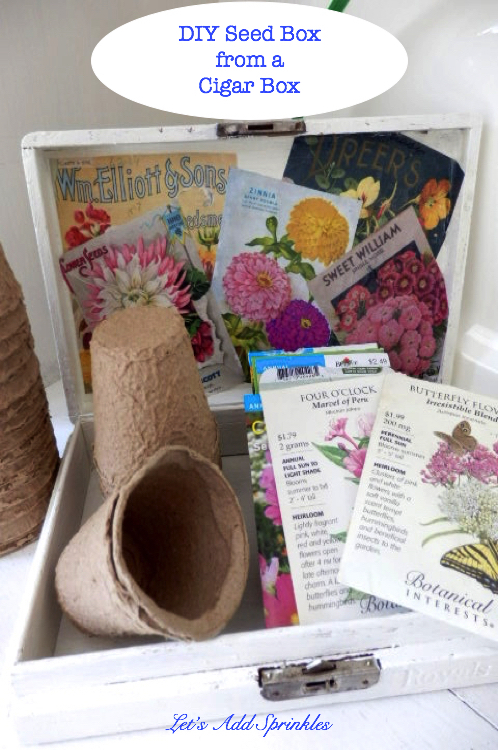 Check out Debra at Common Ground for her inspirational Seed box. This one is fabulous from Home Is Where The Boat Is. Every Pin helps. If you like it - Pin It. I hope it inspires you to make something. This is such a fun project, Katie! The vignette turned out so pretty too. I have admired the seed boxes you mentioned over and over. Now I would like to make one too. We actually have a cigar shop close by that has boxes sitting outside all the time. They are a few dollars so maybe I'll pick one up. Oh I also have an old wooden tool box in the garage...maybe I could use that. You've got me thinking. Can you share where you found the images online? 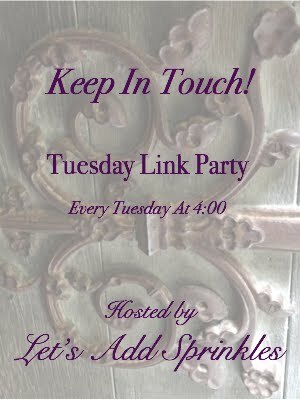 I did a PInterest search but Graphic's Fairy will have some I bet. 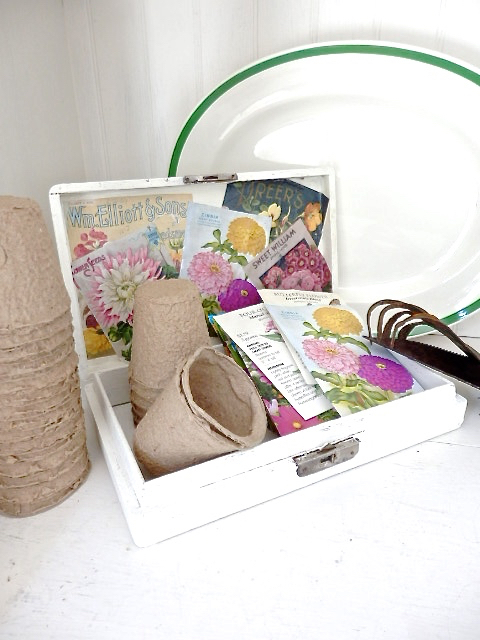 Vintage Seed Box?! How cute! 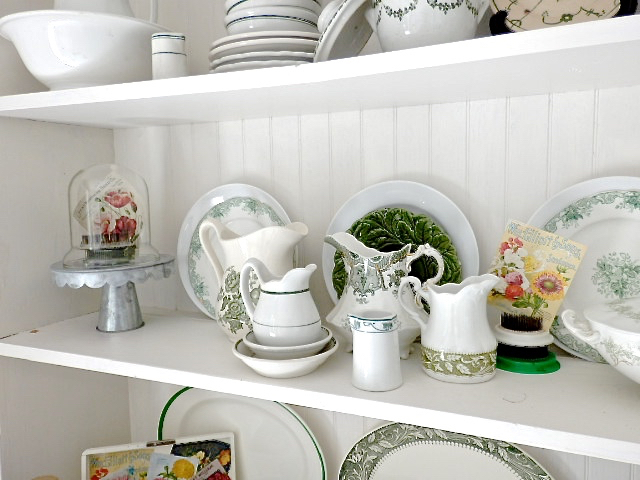 The entire hutch looks darling too. Very pretty. This is a great idea. Love how cute this came out. Love your vignette too. Have a great rest of the week. What a fun project! 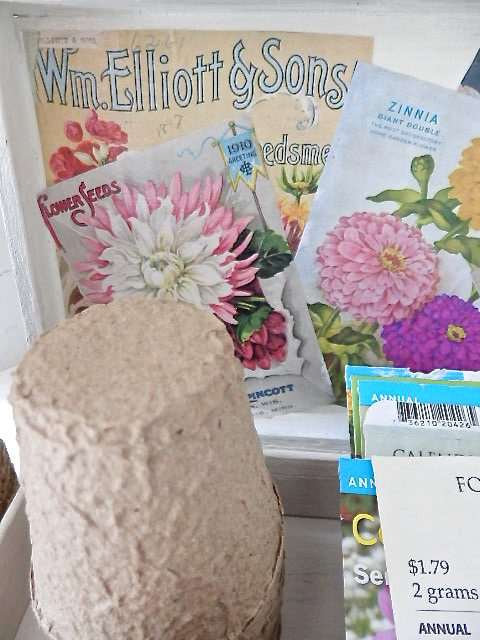 I love pretty seed packages and often save them after planting the seeds. 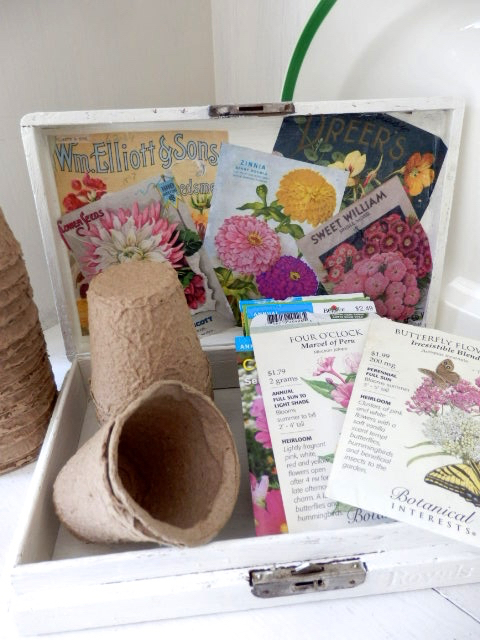 I've had seed box envy since I saw Deborah's on Common Ground. 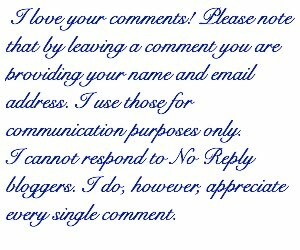 Yours is great and so is your vignette. 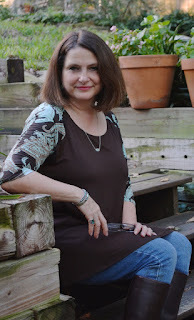 How charming and inspiring.You and Jann are very creative!Hugs! Love it!! And what a charming display you have done to show it off too!! Thanks so much for visiting!! Your seed box is so precious! I love old cigar boxes. For several years at Christmas, I painted Christmas scenes on these boxes and filled them with specialty chocolates and sent them to family members. These boxes are so versatile. I love your hutch too! 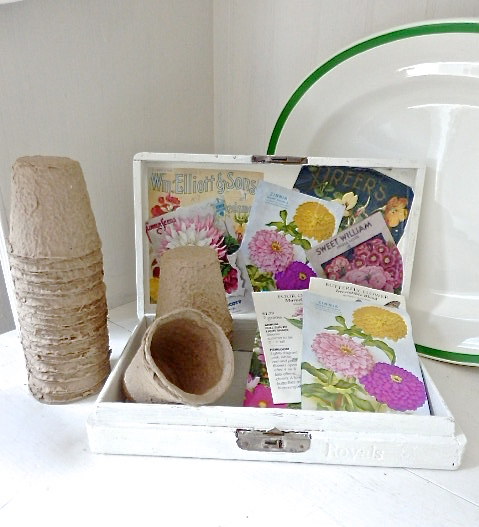 I love your vignette to pieces and the seed box is so pretty -- that's a terrific idea and I love your vintage packets. I do think I need to do something productive with my cigar boxes and you gave me a great idea. How did I miss that great watering can when I went to IKEA? It's fabulous!